Spring Roll Dosa| Dosa Spring Roll| Spring Dosa is a tasty dosa with vegetable filling with Indo Chinese flavours. It tases yummy with the spicy Schezwan sauce sauce with the vegetable filling covered with a crispy dosa made as a roll. 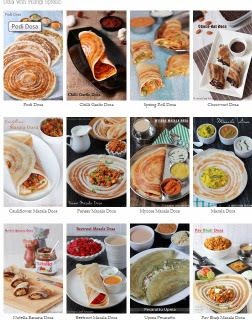 Kids love to eat this dosa rolls as it looks appetizing. 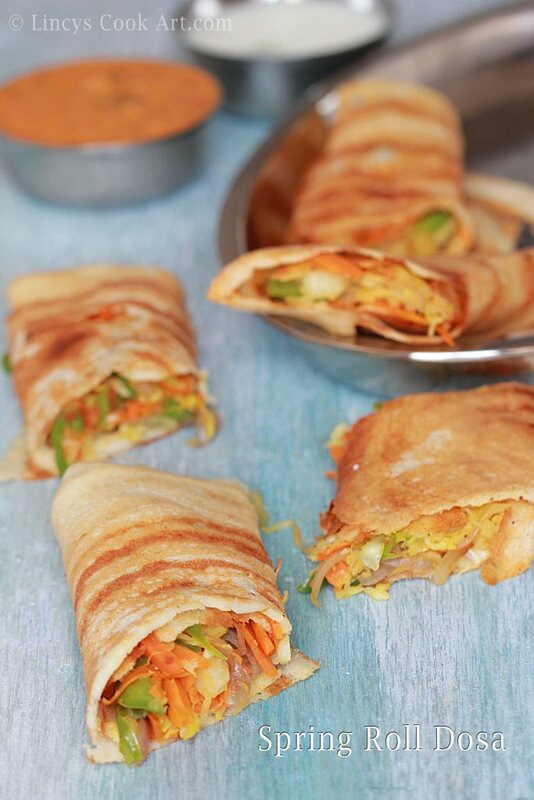 You could make this dosa rolls for kids lunch or tiffin box too. You could add the vegetable of your choice in this yummy dosa. I used to make with beansprouts, broccoli sometimes with some cooked noodles..etc. Non vegetarians add some cooked shredded chicken with the vegetables while making the filling. You could make variant fillings using this recipe as a base. Schezwan sauce, to spread on top dosa- Click this link to get the recipe. Vegetable spring roll - Click this link to get the recipe. You could add cooked shredded chicken if you wish to prepare non vegetarian version. Heat the dosa tawa and grease the tawa with little oil first time then add add a ladle full of batter and spread to make concentric circles. Drizzle with half a teaspoon of oil and allow to cook till the top of the dosa cooks well. Now add the schezwan sauce and spread well on top of the dosa. Now keep the spring roll filling and roll the dosa like a spring roll and cut them in a slanting manner.